We're happy to report that player registrations are officially closed for Swing For A Soldier. See below for remaining sponsorship opportunities. 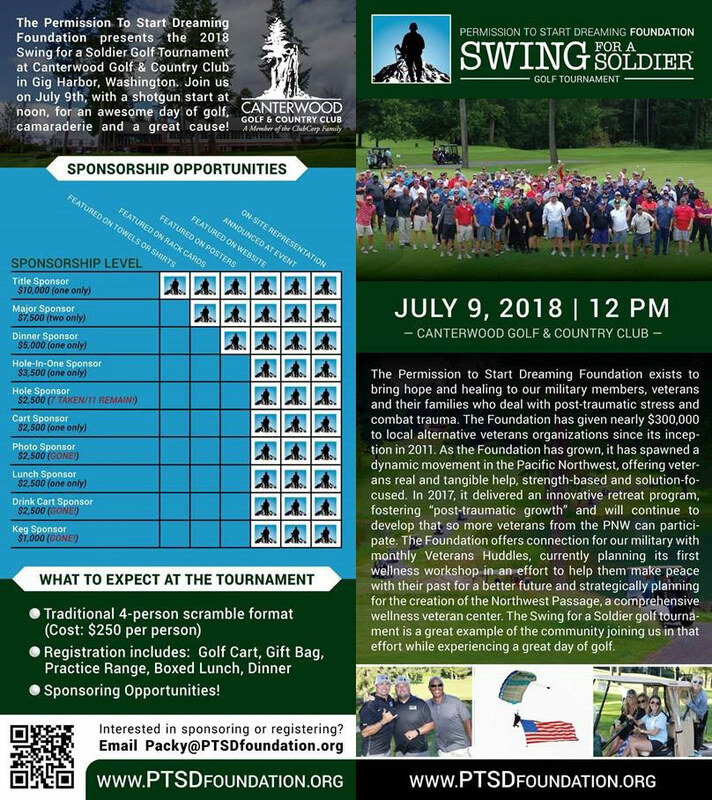 The Permission To Start Dreaming Foundation presents the 2018 Swing For A Soldier Golf Tournament at Canterwood Golf & Country Club in Gig Harbor, Washington. Join us on July 9th with a 12 PM shotgun start for a great day of golf, camaraderie and a great cause! Single and 4-person scramble tickets are currently sold out! I warrant that I am physically able to participate in this event and have done proper training. In consideration of my entry for myself, my debtors, administrators and assignees, I do hereby release and discharge any rights and claims against Canterwood Golf & Country Club, Swing For A Soldier, Permission To Start Dreaming Foundation, Pierce County, City of Gig Harbor, and any other individuals or groups involved with the competing in this event for any or all injuries suffered by me at this event or while traveling to and from the event. I also understand that in the event that Swing For A Soldier cannot be held as scheduled due to an act of God or other circumstances, I am not entitled to a refund of any money paid by me to participate. I also hereby consent to permit and accept responsibility for emergency treatment in the event of injury or illness. I further grant full permission to Swing for a Soldier or any other person or entity authorized by it to use my name, age, birth date, city, finish place, photo and score in the public domain and to contact me by email or U.S. mail regarding Swing For A Soldier. The Permission To Start Dreaming Foundation is a public, 501(c)(3), nonprofit organization. Our tax id# is 27-5251886. This entry form serves as your receipt. Please make a copy for your tax records. Thank you for supporting our mission, our troops and their families!